The entire lineup for 2018's Vans Warped Tour, presented by Journeys, has been revealed today via a special announcement video, which can be viewed now at VansWarpedTour.com. It was previously shared that this would be the final cross-country run for the tour, now in its 24th year. On the upcoming shows, founder Kevin Lyman has shared: "I truly am happy to get the chance to travel around the country one more time to thank you for your support, and bring you another best day ever." 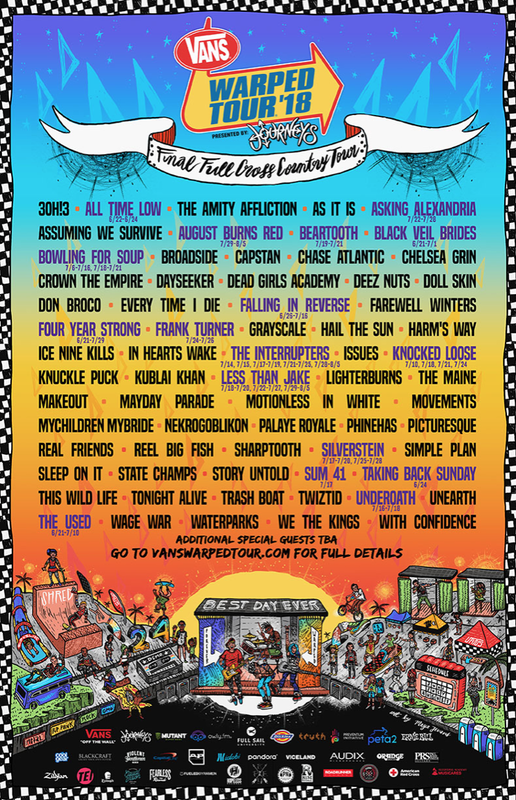 For its final run, the tour is thrilled to welcome back countless bands who have rocked Vans Warped Tour over the last 24 years including Reel Big Fish, Simple Plan, All Time Low, Four Year Strong, 3OH!3, Less Than Jake, Underoath, We The Kings, The Used, Tonight Alive and more. Adding to this year's lineup are up-and-coming acts such as State Champs, Trash Boat, Don Broco, Grayscale, Waterparks, Real Friends, and Movements.